Hudson Valley for No GMOs: "Imaginary Organisms: Media Tout Benefits of GMOs that Never Were"
"Imaginary Organisms: Media Tout Benefits of GMOs that Never Were"
But 18 years after that article was written, the failure of these predictions is clear: No commercial GMO rice of any kind exists, nor has Xa21 or any similar gene for disease resistance been developed for commercial purposes. Neither was the research as novel as the Times made it sound, as the “disease-resistance gene” came from rice originally (Science, 12/95). But being in the Times was certainly a very useful PR boost for plant biotechnology. As it turned, out, this rice couldn’t save any kids—its Vitamin A content wasn’t high enough. But despite the enthusiasm of New Scientist, SciDevNet (2/21/11) and other media outlets, no such cassava is ever likely to feed the hungry of Africa. A subsequent investigation at the Danforth Center found that the “modified” cassava plants in their greenhouses had no zeolin gene in them. They were not transgenic, although illustrations in the PLOS One publication appeared to show they were. The paper was therefore retracted (SciDevNet, 9/26/12). In 2001, US special envoy Andrew Young flew into Kenya to launch a GM virus-resistant sweet potato developed with Monsanto by plant pathologist Florence Wambugu. According to Forbes magazine (12/23/02), its yields were “astonishing,” fully twice that of standard sweet potatoes. These paeans appeared despite the absence of any scientific confirmation of such claims. Years later, celebrity scientist Pamela Ronald (New York Times, 5/15/10) cited “virus-resistant sweet potatoes” as a prime example of “genetically engineered foods that could improve the lives of the poor around the globe.” But no GMO virus-resistant sweet potato varieties or scientific publications have subsequently emerged, from Kenya or elsewhere. Presumably the story reported by Kenyan newspapers, that yields were considerably less than “astonishing,” was the accurate one. While successful nutrient-fortified crops and virus resistance traits are routinely developed in non-GMO plant breeding programs, the creation of edible vaccines seemed to be a potentially unique PR opportunity for GMO crops: “Tangible consumer benefits [from edible vaccines] could turn the debate on genetically modified food,” reported the Financial Times (2/13/00), citing Novartis CEO Daniel Vasella. The edible vaccine concept (variously incorporated into lettuce, tomatoes, bananas or potatoes) was described by the Guardian (9/8/00) in 2000 as “the most exciting area of biological science,” almost ready to “benefit millions of people in the developing world who could not afford Western medicine.” Similar reports appeared on PBS.org (9/00) and in the New York Times (5/14/00), Scientific American (9/00, 5/9/05) and other high-profile media sources. The articles typically focused on the theoretical advantages of edible vaccines (cheapness and ease of preservation) but neglected to discuss their downsides—which turn out to dwarf the problems they are intended to solve (Seedling, 12/00). For example, most established vaccines are not edible. They are injected expressly so as to bypass the saliva and stomach acids that would render them useless. Problems also arose getting GMO plants that produce vaccines to also grow well. There is as well the questionable wisdom of making living medical products that are visually indistinguishable from food, and the problems associated with self-medication by untrained individuals. With plants grown in backyards, how will individuals keep track of the dose they have received? How does one safeguard the food supply against contamination with vaccine genes? How would edible vaccine programs overcome likely inconsistencies of dose due to natural variations in climate, season and other factors? An alternative edible vaccine scenario often put forward, in which the vaccine is grown in a regional centre and distributed from there, poses its own problems, such as how to transport the edible vaccine, which is a perishable foodstuff, separately from the rest of the food supply. As a consequence of these unresolved issues, no edible vaccine has gone beyond the status of a small initial trial in people or animals. Golden rice has the kind of PR to ensure it needs no introduction. The search terms “golden rice” and “vitamin A” generate 106,000 results on Google. Golden rice has genes inserted which produce in its endosperm modest quantities of beta-carotene, the precursor molecule of vitamin A. Golden rice has become the standard- bearer for the humanitarian and beneficial use of a GMO, and was famously featured on the cover of Time magazine (7/31/00) as well as being the inspiration for eight separate articles in the New York Times alone. Describing the protest by “green” parties in Europe against GM crops as a “crime against humanity,” he particularly drew attention to the project to produce a GM rice variety for tackling the problem of vitamin A deficiency in India and other countries. The scientific reality of golden rice, however, could hardly be in greater contrast to this heavy-handed PR. Prior to 2005, all such publicity pertained to golden rice 1 (GR1) (Science, 1/14/00). Amidst an almost total absence of journalistic skepticism, Greenpeace (3/17/05) and environmentalist Vandana Shiva pointed out that GR1 was incapable of solving vitamin A deficiencies because the levels of beta-carotene were too low. This was disputed at the time, but it is a clear acknowledgement of GR1’s failure that Syngenta developed a new rice (GR2) with higher beta-carotene content (Nature Biotechnology, 4/05). The current version of golden rice (GR2) has been the subject of just two scientific publications since its initial announcement (American Journal of Clinical Nutrition, 6/09, 9/12). Nothing is known about its yield or agronomic characteristics, and hardly any more is known about its efficacy or safety. GR2 has not been approved for commercial use or public consumption in any country. It is thus a product still in development, and indeed the transgenes in GR2 have only recently been crossed into the indica rice subspecies most often eaten in Asia. There is thus what must surely be an unprecedented disparity between the number of articles generated around golden rice and its actual achievement, which currently stands at zero. Moreover, in both scientific trials on humans, GR2 was immediately frozen at -70°C to prevent loss of the apparently easily degraded beta-carotene. It was then fed to the study participants with 10 percent or more butter or oil (to ensure the availability of the fat necessary for absorption of beta-carotene). It perhaps doesn’t need saying that -70°C storage capability and comparably fatty diets are not characteristics of those likely to be deficient in vitamin A. 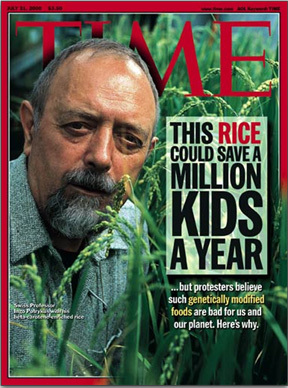 Indeed, following Greenpeace and Vandana Shiva, Michael Pollan (New York Times Magazine, 3/4/01) proposed that golden rice (at that time GR1) was a “purely rhetorical technology.” Pollan’s skepticism proved fully correct, yet somehow few others managed to adequately focus on the key facts. Most of the science media were apparently too enthralled by golden rice’s grenade-proof greenhouse in Switzerland (New York Times, 11/21/00). These misreports of biotechnology are endlessly useful to the industry. Articles about supposed breakthroughs constitute the excuse for stern editorials in prestigious magazines (e.g., Science, 9/20/13) decrying “irrational objections” to GMOs. Supposed breakthroughs, like golden rice, are also an opportunity to prize open specific foreign markets. But the main benefit is less obvious but more fundamental. Agribusiness is an industry whose financial success springs ultimately from building a technological treadmill and establishing monopoly control of agriculture. However, its products are invariably dispensable to agriculture, and it struggles to develop new ones. Therefore, the great value of “fakethroughs” is to confirm, in the eyes of the world, the industry’s claim to be ethical, innovative and essential to a sustainable future. Jonathan Latham has a masters degree in crop genetics and a doctorate in virology. He is the co-founder and executive director of the Bioscience Resource Project and editor of the Independent Science News website, where a version of this article (1/7/14) appeared.